keep plodding on from day to day until finally we reach the goal." The "MoorsfieldPress.com" website was created by myself. I am a relative of Hugh McLellan, the founder of the original Moorsfield Press in Champlain, New York. This website will be used to showcase the history of the Town of Champlain, my historic projects related to the Town of Champlain and my Champlain Historic Calendar series which has been published for over a decade now. The original Moorsfield Press was established by Hugh McLellan to print historical material related to his ancestors who had founded and settled the Village and Town of Champlain. 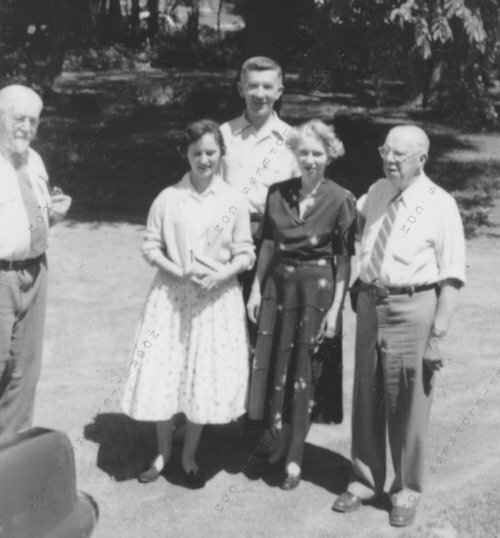 These people were instrumental in the growth of that area from the 1780s to the early 1900s. Many historical publications were written and published by Hugh between 1919 and the 1930s using his Moorsfield Press letterpress. By the late 1930s, the press had become commercial and only a few historical publications were printed afterwards. His son Woody continued with sporadic historic publications but the press was almost used exclusively as a commercial printing press. The press was closed in the early 1980s when Woody became ill and his eyesight diminished. Hugh died in 1963 and Woody died in 1983 and the business was ceased. In the early 1990s, I started to explore the collection of papers that Hugh had amassed over his lifetime and used as the basis for his historical writings. By 1995, I started to write what would become a 1000 page "reference" book that was really a compilation of many of the thousands of papers and bits of information that Hugh had collected. It also contained a lot of historical information related to my ancestor, Pliny Moore, who founded the village and town of Champlain in 1785-88, as well as many other related families (Moore, Nye, McLellan, Hoyle, Whiteside and Hubbell) . The book was finished by the summer of 2002 and was given to a library and a few historical organizations. It also satisfied my goal of digitizing information ifor easy access and searching of key words. The book contained information that has been used as the seed to all of my future calendar publications. My book also contained many photograph that showed Champlain, New York, from the late 1800s to the mid-1900s. The photographs had been taken by the McLellan family. By 2002, with the completion of the book, I wanted to publish these photos in a mass produced book that people from Champlain could purchase. After deciding that a book project might be too grand, I had the idea to produce a calendar. The calendar was written that fall and was published in November for the 2003 year. The calendar had 13 high resolution, large format photographs with detailed descriptions (similar to what one would find in scientific publications). A short three page history about the Village of Champlain was placed in the back. About 250 copies were printed and all were sold (for a village of 2,500, that is very good). The calendar benefited the Plattsburgh College Foundation of SUNY-Plattsburgh. Subsequent calendars continued to benefit the college, and later, benefited the Glenwood Cemetery Association in Champlain. With the calendar project a success, I decided to produce a calendar for the next year and this has continued for at least 13 years now. Each calendar has a historical essay in the back written about a particular subject that relates to the Village of Champlain. The first essay was three pages long, and for 2004, it was increased to seven pages. By 2007 and 2008, it was 11 pages and for 2009, it was increased to 15 pages. The 2015 calendar had 19 pages of essay which included more photo pages. The growth of the historical essays shows that the calendar project has evolved into a much larger historical writing and research project. This was ultimately what I wanted to do with the calendar series: to write historical articles related to Champlain in the same format and style as the original Moorsfield Press and using the original research material that Hugh had collected. The calendar project gave me this opportunity as the audience was more than just a library or historical organization. People actually read these essays. The 2006 calendar was the first one to utilize the Pliny Moore papers that had been collected and transcribed by Hugh. I had wanted to use these papers for several years and I consider this writing as real historical research (as opposed to the essays in the 2003, 2004 and 2005 calendars which were really compilations of information about buildings and events). The 2006 calendar's theme was "The Village of Champlain in the War of 1812" and this subject has not been written about by anyone in such detail. Pliny's papers formed the basis of this essay as he was a central figure in the War of 1812 in Champlain. The 2007 calendar continued my full immersion into the Pliny Moore papers (which is what ultimately made Hugh establish his Moorsfield Press in 1919). I wrote about the founding of Champlain by Pliny between 1781 and 1789. The essay was again based on first-person accounts written by Pliny and his acquaintances and describes how he obtained the "Moorsfield Grant" from the State of New York. A lot has been written about the founding of Champlain (some of it wrong such as him being a drummer boy), but this essay contained more detailed information and maps that have never before been published. My 2009 calendar was to be a continuation (almost Part III) of the last two calendar series and was to focus on more of the early settlers of Champlain. However, 2009 was also the Quadricentennial Celebration year (400th anniversary) of the exploration of Lake Champlain by Samuel de Champlain. At the urging of New York Quadricentennial Commissioner Vice-Chair Celine Racine Paquette (who has helped me with the previous calendars), it was decided to focus on the building of the Crown Point and Plattsburgh memorials and write about the settlers for the 2010 calendar. This was only logical as Hugh McLellan, the founder of the Moorsfield Press, was the principal architect for these two memorials! All of his papers had been preserved and I spent several months researching them and another few months writing what would become a 15 page expanded historical essay. No one has written about the building of these memorials in such detail. The 2010 calendar dealt again with the War of 1812 in the Town of Champlain as well as the role of Dewey's Tavern. The tavern was built by Elias Dewey in 1800 and was on the road to Canada and only a mile or two from the border. Several American armies camped here on their way to Lacolle and the British army under General Prevost also camped here in September of 1814. Many skirmishes took place near here. In the 11 page history essay I focus mainly on the events that occurred at or near the tavern. Champlain Town's overall role in the war is explained in the 2006 calendar. The 2011 calendar focused on the early settlers and settlements in the town of Champlain. The town has four villages and hamlets: Champlain Village, Rouses Point Village and the hamlets of Coopersville and Perrys Mills. I describe the early history of each settlement from about 1783 to the 1830s. Champlain was initally settled by groups of people: soldiers who were from the Albany area who obtained land after serving in the army during the Revolution and Canadians who served in Congress' Own Regiment (under Moses Hazen) and who were granted land by New York State for their service. I discuss who the principal settlers were in each locality and how they contributed to the growth of Champlain Town. The essay has 11 pages and many maps and images. The 2012 calendar was heavily influenced by Hugh McLellan's cemetery papers. Besides collecting historical papers, he also transcribed over 8,500 gravestones in cemeteries in northern New York, northern Vermont and lower Quebec. His son Woody and Woody's wife Hulda Bredenberg continued this work in the 1940s through 1960s. Between 1917 and the mid 1930s, Hugh transcribed all of the town's cemeteries. They were found in fields off of the roads and sometimes far back. He noted where they were and the conditions of each cemetery. All of this information was compiled into binders that are now known as the "McLellan Cemetery Transcriptions". In 2011, with only the booklets to aid me, I worked with Celine Paquette to find the cemeteries Hugh had seen 80 years before. All were found but they were not in the state he saw them. For example, Hayford Cemetery had only a few stones in it in the 1930s but they were readable. The cemetery survived up to a few months before I saw it. At this time, the field was sold by the 80 year old farmer and all the trees and shrubs were removed. It was about to be plowed when the highway superintendent noted to the land clearers that the broken gravestones on the ground were part of a cemetery. The 1 acre plot was eventually roped off but the broken stones remained scattered. Another very important cemetery I re-discovered was the refugee graveyard on the shore of Lake Champlain. Jacques Rouse is buried here. Hugh McLellan noted where it was and transcribed about 20 stones in the mid 1930s. A few years later, bulls got into the cemetery and knocked the stones over. The farmer piled them up and in 2011 only a mound of sod was found. I found the cemetery (another long story) and the farmer, who is in his 80s now, told me all he knew about it. So the 2012 calendar described the history and conditions of each municipal, family and abandoned cemetery in town. The history was compiled from many documents as well as newspaper clippings. For the 2013 calendar, I focused on the early roads and bridges in Champlain Town. In 1794, Pliny Moore petitioned the state for funds to build the first bridge in front of his house (Elm Street bridge today in the Village of Champlain). Later, a bridge in Coopersville was built in 1816 after opposition from people in the village. I also discuss the few early roads in town and how the roads evolved into the highways we see today. The 2014 and 2015 calendars were on subjects that I did not know much about but knew that they were critical to the town of Champlain's prosperity. I learned a lot researching the following subjects. The 2014 calendar focused on boat building on the Great Chazy River and included considerable material on James Averill Jr.'s canal boat yard, established in 1879 in the Village of Champlain. In 1883, he bought an old iron foundry and it soon became the Sheridan Iron Works. This is chronicled in the 2015 calendar which could be viewed as the second part of this series on industry in the town. James Averill Jr. was one Champlain's biggest and most influential industrialists and hundreds of workers and their families benefited from this "dynamo" of a business leader. In fact, a newspaper article from the 1950s called him a "veritable spark plug." I learned a great deal about these subjects over the past two years. The 2016 calendar was the culmination of a project I worked on at the Clinton County Historical Association. Several years previous to this, I had scanned approximately 100 glass plate negatives of Champlain residents taken by Bert F. Paine of Champlain. There was no photographer name on the plates but after some research, I realized he had taken these photos. I was also interested in other photographers in the early Town of Champlain. So I decided to make a calendar dedicated to the portraits of people in Champlain as many of their descendents still lived in town. The 2017 calendar on the history of Point au Fer I view as my best calendar. A huge amount of research went into this and I discovered many facts that no previous author on Champlain history had known about (thanks to the internet). My essay was modeled on Allen Everest's book written in 1990 before the internet became a force for historical research. He wrote a comprehensive history but he did not know about the vast amount of letters relating to Point au Fer that were found in the George Washington papers or papers of his generals (all found online today). This newly discovered information proved to be invaluable. I spent many months bookmarking sites that had information that I needed. When the time came, I sat down and spent a solid 45 days writing the 19 page essay and then another month laying out the calendar myself. I was also able to find many maps from online sources such as the NYS Archives which had digitized many early maps of Lake Champlain (that even showed the elusive "White House"!). I had wanted to write this history since the 2009 Quad celebrations, especially on the establishment of the Point au Fer Memorial Park where an interpretive panel is today. I am fortunate that I was able to write this historical essay. The MoorsfieldPress.com website was established by myself on July 4, 2008, to give my Champlain Historic Calendars more national and international exposure, especially for the 2009 Quad celebrations. I chose the name "MoorsfieldPress.com" because I have continued the historical writings and publications in the style of the original Moorsfield Press which was established in Champlain, New York in 1919 by my relative, Hugh McLellan. Hugh's goal was to compile and publish the historical papers he owned that were related to the Town of Champlain. Hugh and his son Woody published a number of historical pamphlets over the years. In 1995, I picked up Hugh's historical project and have never looked back. Using his same papers, I have expanded on his publications and have also written many original publications, such as the calendar series here. My historical publications keep to the theme and style of the original Moorsfield Press publications. Furthermore, I have digitized many of Hugh's Moorsfield Press publications. So it only makes sense to continue this work using the name of "MoorsfieldPress.com" for my website. I would like to think of my venture as the continuation of their work but using the digital production methods of today in a much more efficient manor. It should be stated that my operation is not a commercial venture and I own no letter-presses or high-end digital printing tools. This is more of a genealogical-history hobby. 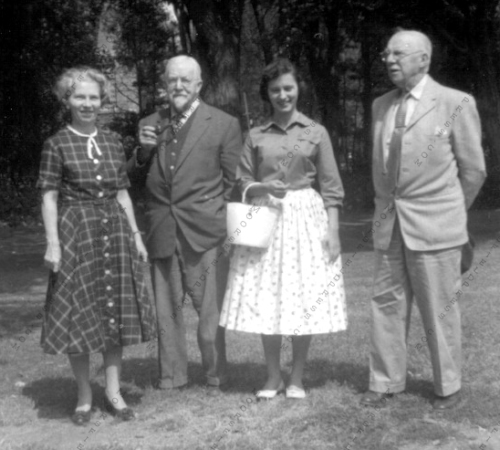 Left Image: Hugh McLellan (left edge), my mother, Woody McLellan (son of Hugh, cousin of Betty), Betty (McLellan) Chimicles (my grandmother) and Malcolm McLellan (my great-grandfather) in Champlain in June of 1957. Right Image: Betty, Hugh, mother, Malcolm, June of 1957. Photos from the family collection of the website author.